Some pundits believe that the Conservatives and serious Christian believers have each others’ ears, on matters relating to faith and governance. And some other serious Christian believers have been trying — in a low profile way — to win the ears of Liberals and New Democrats. 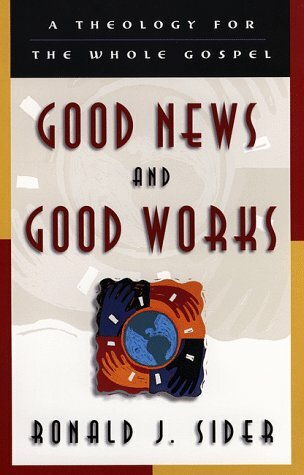 I was reminded of these continuing efforts of Christians to influence various segments of the body politic, while reading Good News and Good Works: A Theology for the Whole Gospel (Baker, 1999) by Ronald J. Snider. The book is part of a winter and spring reading assignment in the run up to my Tyndale Seminary doctor of ministries studies. Canada-born, Sider teaches at Palmer Theological Seminary in Pennsylvania, a Baptist school. He grew up in a pastor’s home, as part of the Brethren in Christ denomination, an Anabaptist group that maintains links with the Mennonite Central Committee. Sider often is described by other Christian leaders as a left-leaning evangelical. The book I am reading provides some clues as to why. His assessment of the gospel — the “good news” — is that it is not only about the forgiveness of sins, but, equally importantly, about Christ’s establishment of his kingdom. Sider’s chief claim to fame was his 1977 tome, Rich Christians in an Age of Hunger. In both that book and Good News, he somewhat less than subtly hints that our society needs biblically-based social, political and economic reform and restructuring. While he does not say which political party or movement is the best vehicle for such restructuring, he advocates assertive Christian leadership in the aforementioned quest. So, why did all this remind me of efforts to “re-Christianize” the Liberals and New Democrats? I wrote some weeks ago (OttawaWatch #318 Elephants in the Room, October 11, 2011) about Dennis Gruending’s new book, Pulpit and Politics (Kingsley, 2011). Gruending writes that he acknowledges the influence of evangelical Christians of various stripes on Canada’s centre-right politics. He urges “social gospel” Christians to try to have the same kind of influence on the political left. Gruending served a short stint as an NDP MP from Saskatoon after a 1999 by-election. More recently, he did communication work with the Canadian Conference of Catholic Bishops and is now similarly engaged with the Canadian Labour Congress. He and his wife attend a Mennonite church in Ottawa. Just a few weeks after Pulpit was published, United Church minister and former federal and Manitoba provincial NDP politician Bill Blaikie released a book covering some of the same ground. It is entitled The Blaikie Report: An Insider’s Look at Faith and Politics (United Church Publishing House 2011). I have not read it yet, but may pick up an e-copy as supplementary to my perusal of Sider’s writing. But what of the Liberals? John McKay, MP for Scarborough-Guildwood, has spoken often about what he sees to be the need for his party to pay more attention to those of its members who are serious Christian believers. He has been prepared, at times, to be known as a “blue Liberal” — one who has some things in common, on both economic and social levels, with small-c conservatives. But he has chosen to stay with his party and bring to bear whatever influence he can. More recently, he has hinted, in some quarters, that he would like to encourage pastors and other Christian leaders to join with him in bringing biblical values to bear on his party. He will no doubt keep a low profile on these efforts, learning some lessons from the Conservatives. They have felt burned by sometimes outspoken Christian leaders who have tried to communicate the idea that they had more influence with the party in power than they really did. To bring this piece to a head, let’s return to “Across the Spectrum”, the headline I am using for today’s OttawaWatch. The fact is that Christian influence can be seen across the political spectrum in Ottawa. And, it is, indeed, a spectrum, where viewpoints are scattered along the landscape. Ron Sider, in his writing, acknowledges the spectrum. In my own 14 years in Ottawa, I have observed that the faith-based influence in the Conservative party has helped it to broaden its policy perspective. Further, that influence has made it a more collaborative party, listening with care to perspectives outside its usual comfort zone, while staying true to its market-oriented, small government approach. But there is more to the political spectrum than the centre-right. People like Blaikie and Gruending have concepts to communicate that could bring new strength to their end of that spectrum. They can do so by encouraging a new look at the social gospel, while at the same time, reducing the “class warfare” perspective that sometimes makes the left more combative than it needs to be in this post-modern era.